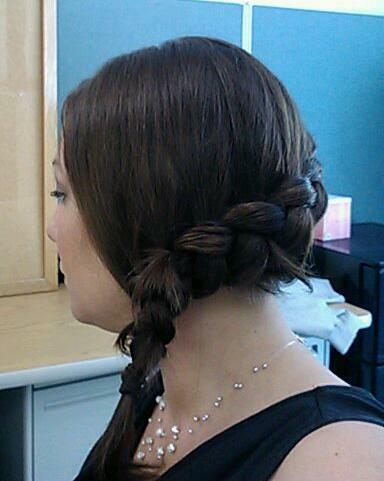 I did this hairstyle earlier this year, and I hadn't seen the Hunger Games movie. 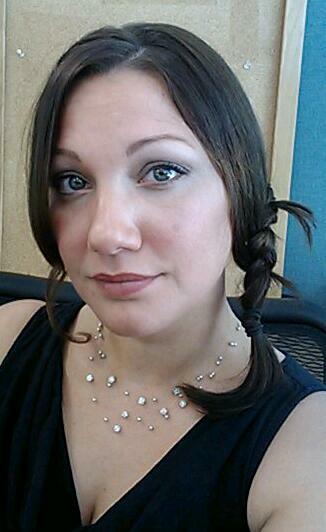 I was later informed that this is the "Katniss Hairstyle". I disagree, though, based on the number of strands I used vs. how many they used on Katniss. It looks like they used at least four strands to make her braid... if not five. But, yes, the shape and idea is the same. Once you get the basic Dutch Braid down, you can google for tutorials on how to do a four or five strand braid and really re-create her look. It really isn't that hard, it just takes some practice. All a Dutch Braid is, is a French Braid, except instead of passing the hair over the top of each other, you go UNDER. 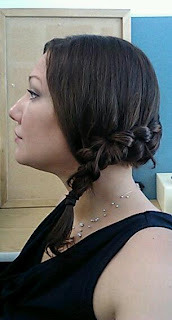 This results in the plait (rope looking part) sitting on top of the hair, rather than underneath it. Since I have learned how to Dutch Braid, I never French Braid anymore. The Dutch Braid feels more secure to me, and I think it looks better. 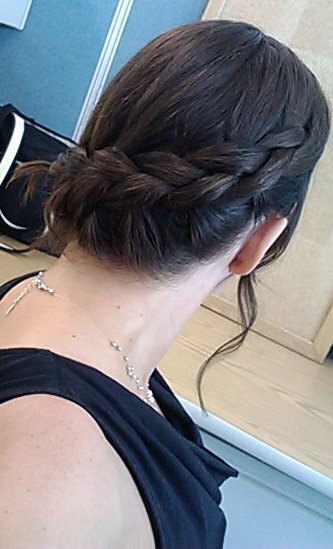 For my braid, I used three strands, and I started with damp hair. I usually start all my updos with damp hair. It will make the overall look seem flatter in photographs, but in person, it looks just fine. My hair likes to wave and curl, so starting with damp hair gives me a smoother, frizz-free look. If you want to start with dry hair, keep in mind that freshly-washed hair does not like to stay in updos, so it may be better to try a braid on a second or third day (assuming you don't wash your hair with shampoo every day). To start, I pulled out some bangs, and a bit of hair that I planned to make into a long curl. Then I started on the right side of my head and sectioned out three pieces of hair in the front. I named the pieces Top, Middle, and Bottom. I moved Bottom under middle (so now Bottom has become Middle, and Middle has become Bottom), and then I moved Top under Middle (so now Middle is Top, and Top is Middle). Next, I took the next one inch Vertical section of my hair, and split it into two pieces horizontally, adding the top half to Top, and adding the bottom half to Bottom. Then I moved Bottom under middle (so now Bottom has become Middle, and Middle has become Bottom), and then I moved Top under Middle (so now Middle is Top, and Top is Middle). Pull your braid tight enough that it stays in place, but try to not pull too tightly. The more tightly you pull, the thinner your braid will be. Usually, people like their braid to be very fat, and if you don't have super-duper-thick hair, the only way to get that look is to not pull to tight, and to "fluff" it at the end. 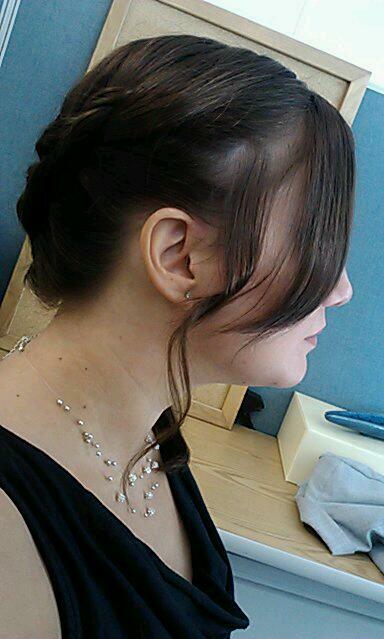 I like to angle down towards my lower hairline, and run the braid along that area. Then you get going towards the back. I have pieces of hair that stick out along the braid. If you want, you can tuck those into the braid and pin them in place. I don't care that they stick out, so I just leave them alone. And here is getting towards the other side. Now, you have to not start angling up at this point. It is going to feel weird, like you have a sheet of hair being pulled down the side of your face, but if you don't keep angling down, you are going to end up doing a Dutch Crown (which is pretty, but just not what we're going for right now). Alternatively, you may want to keep it angling down, but not have that sheet of hair over your ear. That's fine! Just pull the hair behind your ear, into the braid, and there you go! I tried both looks, and I felt that keeping the ear covered made the style look less casual. So keep on braiding the tail until you either run out of hair or feel like stopping. I like to stop braiding before my hair starts to taper, because it makes the braid look much thicker. You can also gently tug at each hump, and it will fluff out your braid more. And here is the front! I used a curling iron to curl that long piece, but I kept combing my bangs flat as I braided my hair, so I didn't have to do anything to them. I did not fluff my braid when I was done, because I thought it looked big enough as it was.